This smoked pepper and eggplant relish, known as ajvar (pronounced EYE-vahr) is a salsa-like staple in southeast European countries including Croatia, Serbia, and Turkey. 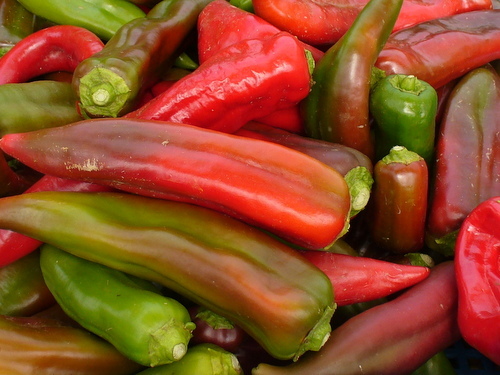 There are several styles of ajvar, some using red and others using green peppers. Some recipes simply chop and boil the vegetables, while others roast the peppers to bring out spectacular flavor. This recipe uses roasted sweet red peppers and is quite addicting. Where live, sometimes summers are cool and not suitable to growing eggplants. So, I have found that firm zucchini or summer squash can be substituted for the eggplant in this recipe and turn out an equally delicious pepper relish. For information about making other types of relish and many other preserved foods, get the book The Home Preserving Bible by Carole Cancler. Roast the peppers and eggplant (or zucchini or summer squash) over a charcoal or gas flame, or in a preheated oven at 475°F until the skins are blistered and black. For zucchini or summer squash, roast grill or roast until lightly browned. Place the roasted peppers and eggplant (but not zucchini or summer squash) in a paper bag or wrap loosely in aluminum foil for 10 minutes or longer, to steam and loosen the skins. Peel the peppers and eggplants and discard the skins, as well as the stems and pepper seeds (cut in half to scoop out pepper seeds). Roughly chop the pepper and eggplant pulp (or whole, lightly grilled zucchini or summer squash). Place in a large (4-6 quart) , heavy stockpot with the water, vinegar, lemon juice, olive oil, garlic, sugar, and hot pepper. Bring to a boil over medium high heat. Reduce heat to a very gentle simmer and cook slowly for 3 hours, stirring occasionally and checking to be sure the mixture does not stick to the bottom of the pan. Cool and store in sterilized glass jars in the refrigerator up to one month. Like salsa, this relish should not be put into metal containers as it can adversely affect the flavor. Serve ajvar as an appetizer spread on crusty bread or pita wedges, plain or sprinkled with salty cheese such as a feta. This pepper relish is also a great as a sandwich spread, or an accompaniment to grilled or roasted meats especially lamb, chicken, and sausage. Shop for food preservation cooking tools and equipment on the Amazon marketplace. You can quickly find what you need for any food preservation method. Then simply order and pay using your safe and secure Amazon account. Find everything you need to get started with canning, drying, fermenting, pickling, curing, freezing, or sealing foods. Tagged eggplant, peppers, summer squash, zucchini.